One of the problems of blogging is not just writing an article, purchasing a domain or getting high traffic, rather it is simply the best SEO practices to try out to get your blog recognized by search engines and also get them to prioritize your content on its first page. At my early days of blogging, all I did was write interesting articles and sometimes they get featured on search engines while other times they are just stock up on my blog but with time I realized those that actually want your content are those that search for it, not persons you attract on social media. So I thought of how best to do this, then I started searching over the internet, I started learning, I started implementing the ones I thought as useful and left the ones I felt wasn’t useful. Before the end of last year, I could already see high improvement in my Organic traffic and also the way my blog was being featured on Google search. There were some articles that came up first on the list while others on the first page depending on your keywords. The following practices will work very well for BlogSpot blogs and WordPress blogs. There are simply general practices that have worked for me, and I hope they also work well for you. Moderate implementation of keywords is what matters. How do I know a keyword? A keyword is simply a word or sentence that is related to your post. E.g: I am writing a post on “SEO Practices To Get Your Site On Search Engines”. 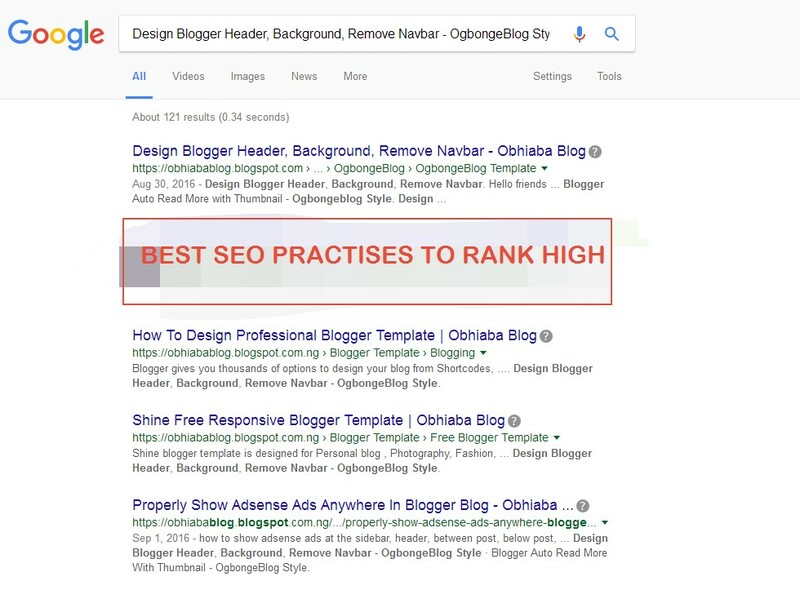 Now my keywords here should be “SEO practices and Search Engine” because they both explain what the post is about and if a user is to search for this post, she could just type SEO practices for a blogger blog and will still find my post on the list. At the last paragraph of the post. If you want something good, then you have to work for it. 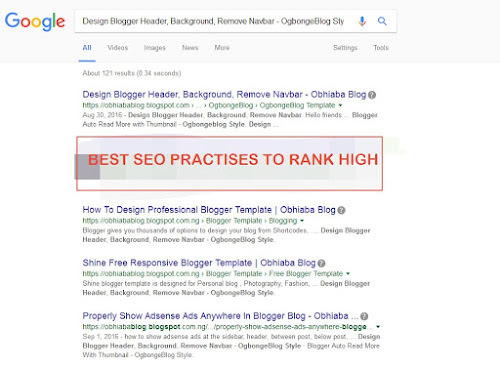 In other to improve your blog SEO rank, you need to work on your template by practicing a few on page SEO tips which include optimizing the blog title, enabling meta description for all post and also adding a 404 error redirect page. These will help you improve the SEO of your blog in no time and help you rank high in search engines like Google, Yahoo, and Bing. This section of optimizing your blog is only for BlogSpot bloggers because blogger.com at the point of establishing default blogger templates made some really poor mistakes which have reduced the ranking power of blogger blogs. When you use default blogger templates, then your blog titles are poorly optimized in the sense. With blogger default templates, Post title which is very important is not given that power rather the power is giving to the sidebar which is not actually important. So when you optimize it, you hereby change the post title from H3 to H1 in post pages and change it from H3 to H1 in homepage while the blog title will remain H1 in homepage but will become H2 in post pages. In this format, all your headers become very powerful. Along the line, you will also be required to place a unique set of codes on your blog. These codes perform magic and if duly followed you should see your blog ranking top one of search engines. All in One SEO Pack is a plugin I have developed for blogger blogs which enable them to fully optimize their blog. This code does not only make your template fully SEO advanced, rather it also gives a whole package of social media tags, search engine tags, and rich twitter cards. With this codes, every post users share on your blog, will look unique and neat. We add images to our post mainly to show the users more information about the post and also to beautify the post section but we don’t really know that aside from the look and feel, Images play a big role in our blogs. Many blogs today gain their strength from the optimization of images. When you optimize your blog images, then your blog will be featured on image search which increases both traffic and blog power. All you need to do is to make sure you add Alt tags and Title related to the post to every image on your blog. If your post is about Linda Ikeji Blogger template then you should add an alt tag similar to Linda Ikeji blogger template or simply blogger template. The Same name can be applied to the titled. Ever wanted to show your post on search engines just 2mins after publishing? then this is for you. I found this great tool when I was an entertainment blogger. With google search console, you can show your post on search engines just 2mins after publishing. Go to Google Search Console and click on add property. Input your blog URL and verify your blog. After verification, simply go to your dashboard and clink on Crawl >> Fetch as Google. You should now see a box close to your blog URL simply paste the post URL without your domain name >> clink on fetch. verify that you are not a robot and that is all. Search for your blog post a few minutes later and you will see the post already listed. You might think this is all for traffic but it is more than traffic. When you share your blog post to social networks and get a lot of likes and clicks on your link, then google and other search engines will see your post as important and show it on search results. The best social networks to do is Google Plus, Facebook, Twitter, Pinterest and other networks that have a high number of active users. You can also use the newly launched Linda Ikeji Social which does not only give you traffic but also gives you a do-follow backlink. Answer a few questions related to your blog post on a big question and answer forums like Quora. Once you do this, you will get a link linking to your article and this will make google prioritize your content. There are other SEO tips which will work well for you. These are the few selected ones I have used and has impacted well on my blog. Ever since I started using these SEO practices, my blog has been getting more Organic traffic and also quality ranking. I advise you to try out these steps and don’t be in a hurry to see things work because of everything, as we know, takes a time to grow. With time your blog will get more recognition from search engines and co-bloggers. Happy blogging and this is Prince John Okosun the author of SEO Practices To Get Your Blog On Search Engines. Welcome.. Thanks for seeing it worth a comment.